Background: Hailing from Elspelia, Howell is the only son to Geran (human smith) and Ylisé (elf maiden) who were both faithful of Elan and dedicated to their homeland. Raised in Foamouth, he grew up hearing legends of Carthas. But what really intrigued him was the tales of nigh-untold riches of the dangerous land. Rumor held that a successful adventurer in the lands could become fabulously rich. Whether or not that was true didn't matter. He dedicated himself to rising above his parents meager station. 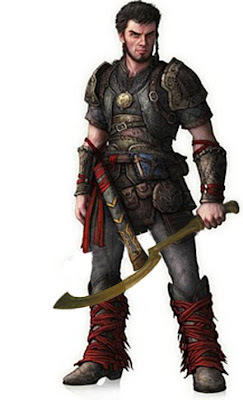 Training with his grandfather's khopesh and fashioning himself over time armor of chainmail, he has prepared himself to seek out the ruins that would give him the riches he desires. Catching on with a caravan, he has arrives in the town of Cebol on the border of Lost Carthas ready to take on the perils. Last edited by konrad13 on Wed Jun 04, 2014 9:16 pm, edited 5 times in total. Hair: Waist length, glossy black. Face: Narrow with sharp features. Has a habitual forbidding frown that makes her plain looking but a rare smile reveals that she can be actually quite pretty. Build: Light boned with long limbs. Wiry. Wears: A simple dark gray tunic, worn black leather pants, worn black leather boots -soft, a hooded woolen dark gray cloak as necessary. Hutrehis. Too gentle for Sen. Too peaceful for Sen. Much much too domestic for Sen. There was darkfire in Sen's heart to match her midnight hair. A quicksilver flash of temper in Sen's gray eyes. A sharpness to Sen's tongue that was the despair of her parents and their hope to marry her off to their neighbor's oaf of a son. Pleasant? Oh Sen was pleasant. Pleasant as a spitting wildcat. Sen's parents reconsidered. They had other daughters to marry off for gain. Sons to plow the fields. Better to teach Sen the sword and bow said her father. Her mother agreed. Her father taught her all that he had learned while in the King's guard. Sen was quick to learn. Sen was fast. Sen was strong. Sen could take a blow. A season he taught her. A year. Then three and she was a child no more. A blade and bow her father gave her. Her mother a silver clasp. To the border she turned her face. With a single wave she was off. To Huirenso first went Sen. To equip herself. To the villages on the border of the ruined land she went next. To plan. To adventure. Last edited by Jered Taikith on Fri Jun 06, 2014 6:21 am, edited 14 times in total. Tuk has no memory of his true family. The earliest memory was Grruff who was a large dog that took care of Tuk. Surviving in the rough and dirty streets of a Torumila border town near the ruin lands would have been impossible if it was not for the family that Tuk found himself with for it seemed that he had a special touch with animals. While he couldn't talk to them, he could almost feel what they wanted at times. It was late in one winter when foraging food in the rubbish heaps behind a tavern for his family that Tuk got attacked by some ruffians that were looking to hurt someone or something for fun. Tuk was able duck and roll under one of their attacks then he ran but instead of into the town back to his family, Tuk lead the ruffians into the nearby woods. He lead those ruffians on a wild chase for hours as he played with them for the woods seemed alive and responsive to this young halfling. Sometimes a tree would reach down and smack a ruffian in the face it seemed or a root would pop up to trip the other one but the ruffians we intent on bleeding Tuk. Deeper and deeper into the woods Tuk went and soon was lost himself. The ruffians were not seen nor heard for a length of time, the cold was seeping in through the ragthin bits of clothing he was able to scrounge, the woods that seemed so friendly and welcoming took on the feeling of old and uncaring. What light that could be seen was faint and far between. Tuk had no way of knowing which way to turn or go so he called out in his innocence a plea for help. In what seemed to be hours and hours but in truth it was only a few minutes a pale late appear off in what seemed to be a far distance. It rapidly approached or grew for Tuk could not say until this small slender woman was standing in front of him with the pale light emitting from her body. As her voice fades away, Tuk walked out of the woods and into the nearby field with the morning sun rising to shine in his face. Grruff and others of his family is seen running up to great him in the only way they can, with licks and sniffs along with head butts. Years later, Tuk remembers the lady and what she said. He has spent years learning all he can about the world around him, the animals, the seasons, the plants, and how they all belong together. Over those years, Tuk had to bury his family members one by one as they died by accident or by someone’s blade. Once Grruff went into the ground out at the edge of the woods, Tuk decided it was time for him to leave the village for there was nothing to hold him anymore. Tuk left everything he grew to know behind and faced the sun for each day was new to learn and grow. Last edited by Metroknight on Sat Jun 14, 2014 11:42 pm, edited 5 times in total. Background: Caesar Wayvkrest was born in Hutrehis.He is the third son of Baron Quintus Wayvkrest and Baroness Maria Wayvkrest.As a child he was always getting into trouble.He would often pretend that he was exploring the lost kingdom he had heard so much about in history class.Time passed as a teenager he turned to more realistic goals such as party with as many people as possible but he soon grew tired of Hutrehis and wished to leave.So it was that he asked his parents for a large sum of money to use for "an investment" his parents didn't believe a word of it.So he presented them with a fake ad for a university saying that he wanted to go that he would change.Reluctantly they gave him the money.Which he used to leave Hutrehis he then proceeded to buy extravagant clothes and the best food,he gambled,he threw large parties and did many more things.Two years later when his money finally ran out he came home.His parents were very angry with him but he just shrugged it off thinking that they would cool off eventually.And he resumed his life as if nothing had ever happened.His father wrote to the different monasteries in the country asking if they would accept his son.The Abbot of St.Eadweard responded saying that he would gladly receive him.So Caesar spent seventeen years in the monastery he cooked,he cleaned he did every form of "servant work" possible.He also studied he learned about the surrounding lands,he learned more about the lost kingdom which rekindled his love of adventure.On his last day his parents arrived and gave him a choice they said "Caesar you can come back home with us or you can stay here and be ordained. "He chose to stay and was ordained in the next two days.He then began to travel making his way to Celob a small village near the lost kingdom. This is where all the PCs who die in the course of this campaign go. She will be mourned by a little unknown halfling. Last edited by Jered Taikith on Sat Jun 14, 2014 6:12 pm, edited 1 time in total. From a Torumilan military family. Has recently completed her term of duty in the Guard and has decided to seek her fortune in a life of adventuring. Leather Armor (Black),Two-Handed Sword, Shortbow, Shortbow Arrows (20), Quiver, Dagger, Backpack, Clothing (Black Leather Bodice, Black Leather Pants, Black Leather Belt, Short Black Leather Boots), Lantern, Oil - Flask (2), Tinder Box, Whetstone, Rations - Dry (6 days), Rope - Silk, Waterskin (7 days), Blanket. Caoilfhinn is small for her race, standing under the normal five feet and looking to weigh far less than what is normal for female elves. She is often mistaken for being an elven youth but is in fact over a century old already. Brilliant flame red hair grows in great waves from her head, setting off her pale skin that never seems to tan despite nearly a lifetime spent outdoors. Her striking green eyes are the only thing large about her face, the rest of her features being small. Her clothes tend towards earthen tones. 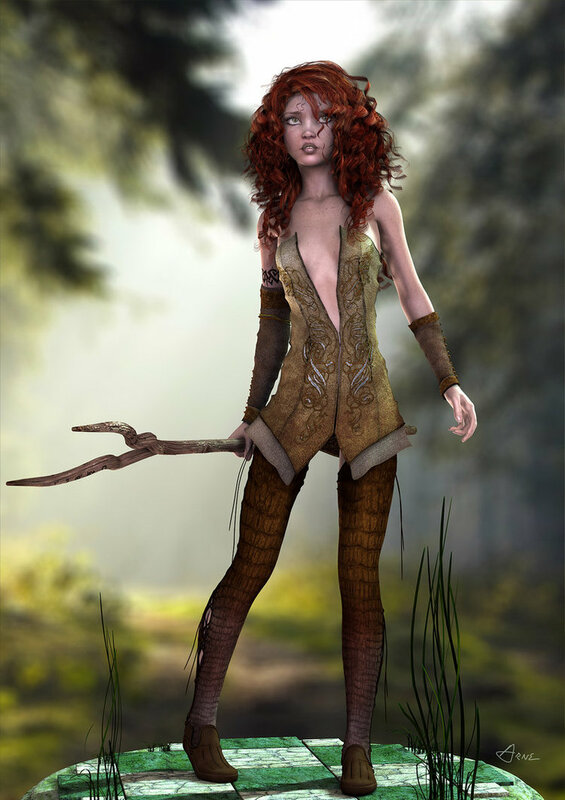 Caoilfhinn was born in the depths of the Torumilan forests to unfortunate circumstances as she would never come to know anything of her birth parents. Her father had died before her birth and her mother died bringing her into the world. The gods protected her by delivering her to new parents in the form of a mother tiger that had recently lost its own young. The tiger-mother took the elf-child for it's own, protecting it from the more savage elements of the wild and keeping it fed for the first years of its life. Eventually the young elf was joined by tiger-siblings, the small family enjoying a couple years of prosperity and peaceful days. At the tender age of 5, the elf-child was separated from its mother thanks for a weak embankment and a swift flowing river. Again the gods must have protected her, for she was plucked out of the water by an ancient elven man by the name of FarWalker. A longtime druid, caretaker of a large portion of the forest, he thought he had seen much in his many centuries but the feral child that acted more like a cat of prey was something new to him, but he viewed it as a blessing from the Earth-Mother and with the blessing he felt it as his responsibility to care for the girl. With that, Farwalker took the girl in as his own, grateful for the centuries he had lived to give him the patience. Not only was the girl more animal than person, but she had no interest in integrating into any sort of humanoid community. With that, FarWalker decided to try a different tactic and so took the girl back out into the wild. For many years, the two were each others' constant companions while exploring the forests of Torumila. some of the social customs, learning thee common language, and FarWalker even named her. For nearly a century the ancient elf and the young elf were always with each other, as close to real family as the girl would ever have. But ancient as he was, FarWalker knew that it couldn't last. With that in mind, the two took one last trip into the depths of the wilds, to FarWalker's favorite place. In a small glade, with the stars overhead and nighttime insects chirping, the ancient elf directs EvenSong to venture out into the world, to explore more than just the forests. She is told to go and see the great salt sea, to explore the vast grasslands, and to see how the various races interact with the earth. Following that night, Caoilfhinn trekked back through the forest, gathering the small number of posessions she had and immediately left the forest. For years the young elf moved through the various lands, learning their customs and stories, and her feet eventually brought her to the edges of the Ruined Lands, the one place she had yet to walk.